Do you love camping? If you do, you have experienced sleeping inside a tent. Isn’t it nice to sleep in a tent with nature around you? Spending time outdoors is indeed a rewarding experience. Apart from being able to appreciate the creations of God, you will also feel relaxed outdoors. 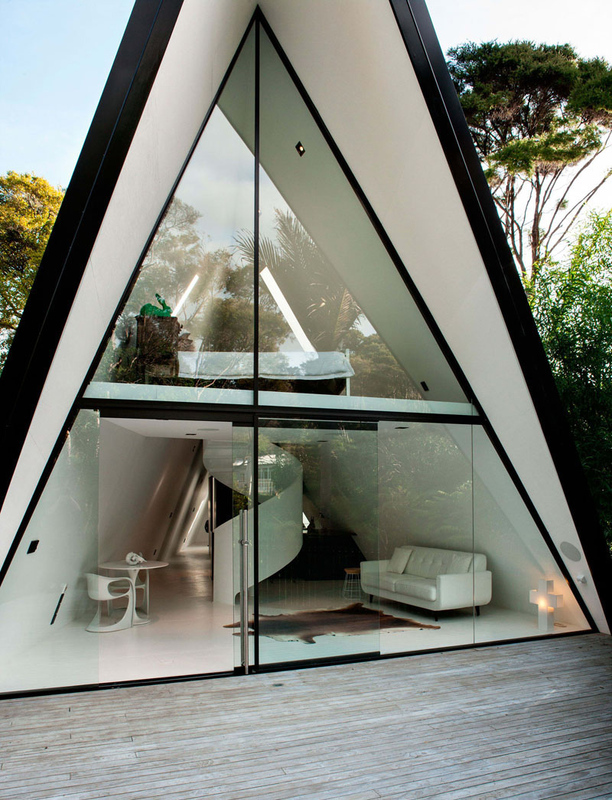 But how would you feel if you are inside a house that is shaped like a tent? You would be reminded of camping but you will get a totally different experience while inside the house. 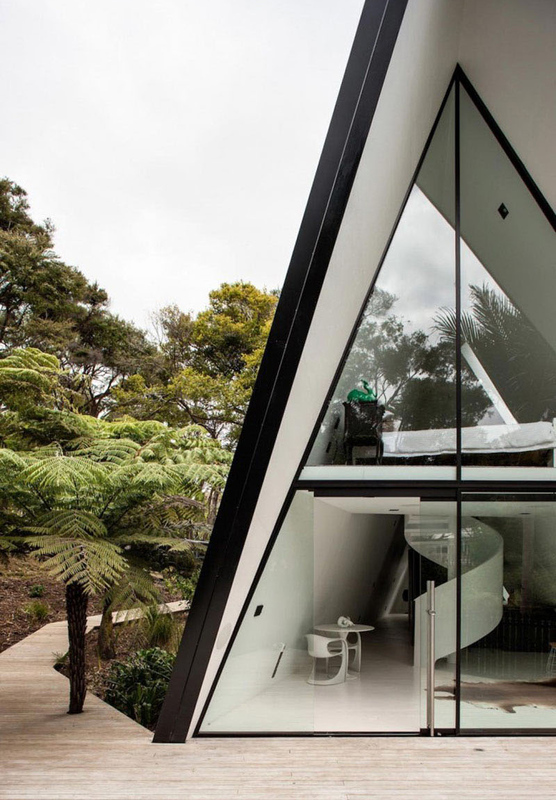 Today, we are going to show you the Tent House located in Waiheke Island, New Zealand. Well, from the name itself, it is indeed like a tent only that is sturdier. The triangular structure is complete with a living room, dining area, kitchen, bathroom, and bedroom. 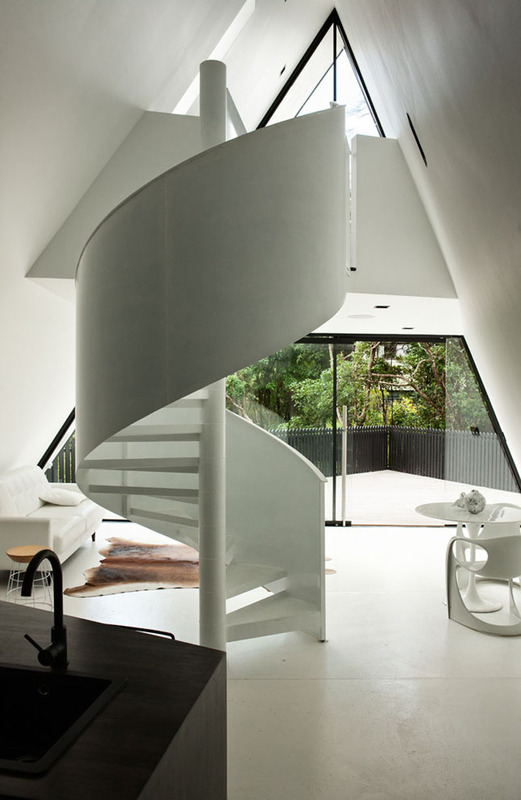 The bedroom can be accessed through a spiral staircase. Everything inside the house is white except for the kitchen. You will surely be amazed at the design of this home! Unique feature: The design of the house is inspired by a tent and it does look like a tent but it has a modern minimalist interior. The upper level can be accessed through a spiral staircase. 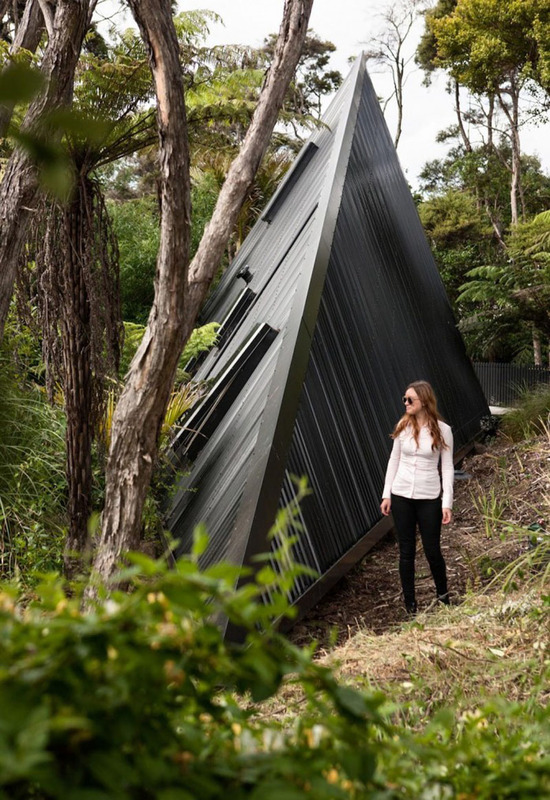 The Tent House on Waiheke Island in Auckland was designed and built by architectural designer Chris Tate. 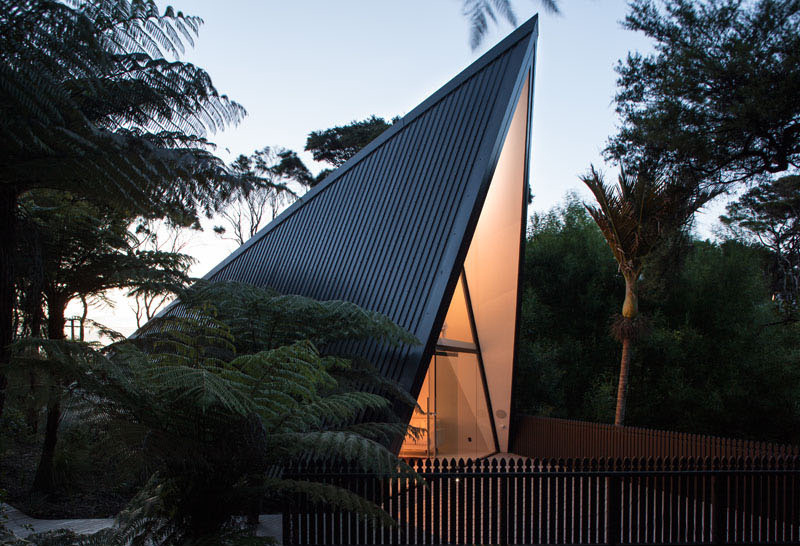 This is a tiny, triangular house that has won a residential design award and been the subject of much interest on the island, thanks to its crisp, cool architecture. 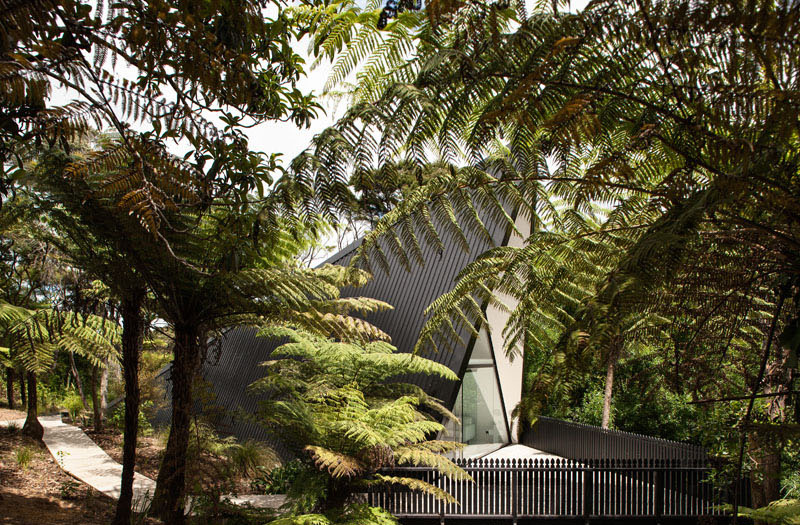 Native bush surrounds the house – a key feature of most of designer Chris Tate’s projects. Here’s a view of the back of the cabin where you can really see the angles and inspiration of the shape of a tent. Wanting to capture the back-to-basics simplicity of camping, Chris designed the Tent House with two levels that feature a main floor with the living, dining, kitchen and bathroom, and a top floor with the bedroom. On the other side of the house, you can see that it has a tall glass window and sliding glass door. Aside from giving access to the outdoor area, the glass sliding door also allows the entry of natural light into the home. The interior design of the house is clean and sleek which is perfect for its limited space. It is also a good idea that it is white in most of its areas. 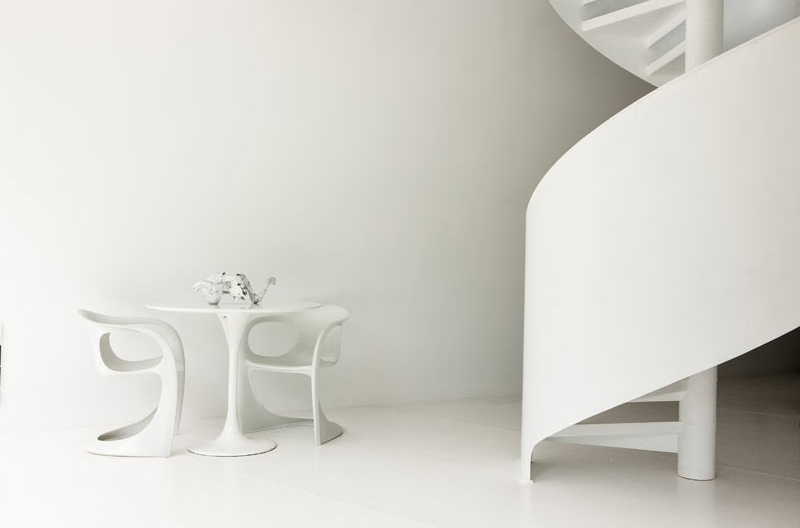 Separating the living area from the kitchen is a spiral staircase leading to the bedroom. 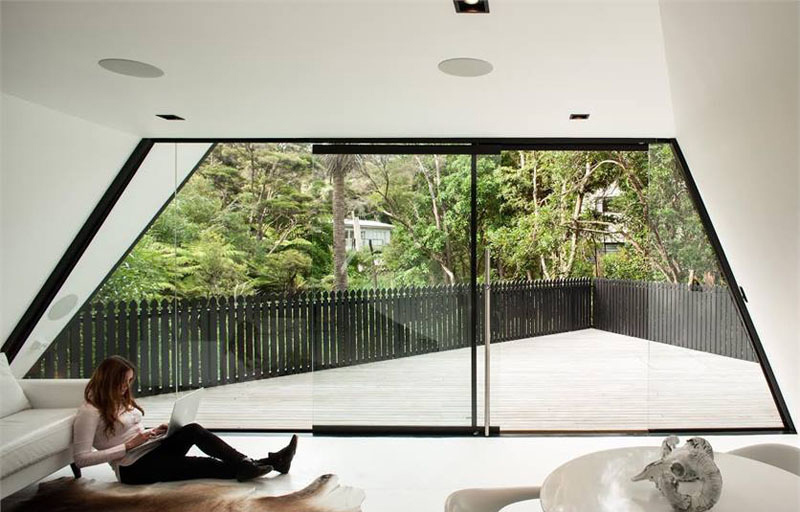 Large windows on one end of the small house as well as smaller ones on the side of the building provide plenty of sunlight, while the white interior helps to reflect the light and is a strong contrast to the black exterior. The only black on the interior of the space is in the kitchen and the bathroom door. The kitchen has been designed to perfectly fit the triangular shape of the space, with the angles accentuated by the strong contrasting lines of the cabinetry. Seen here is the dining area in white. As you can see, only the kitchen is black while the rest of the home is white. 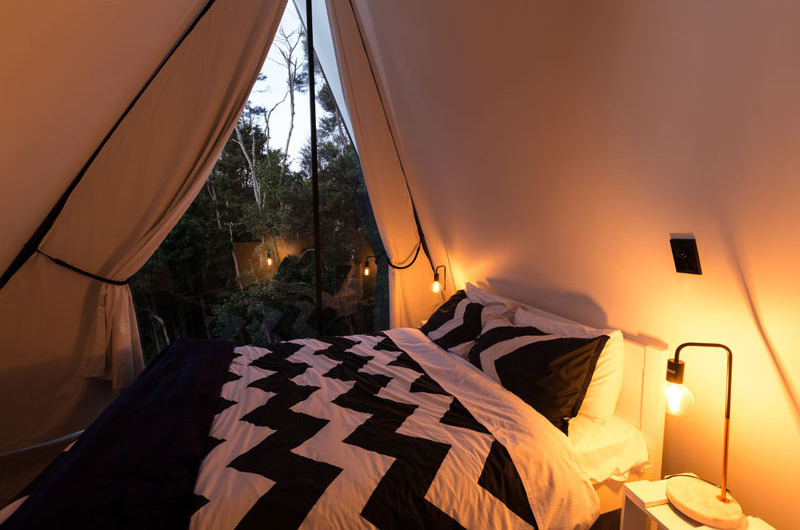 The bedroom which has a view of the treetops, also has draped curtains, much like the entryway to a tent. At night, the interior of the cabin is lit up like a lantern. When you look at the house from the side, it really looks like a tall tent! It sure is a wonder of architecture! This project is designed by Chris Tate Architecture and because of its unique design, many people visit the place to take photos. 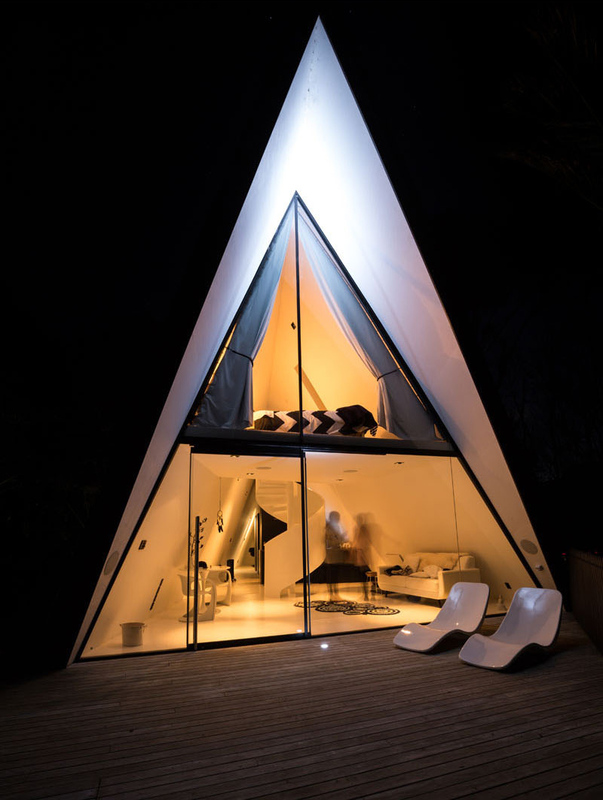 The tent house will definitely give you a different kind of camping experience. Instead of gazing at the stars, you can feel the comfort of the home in its modern minimalist interior. And you are surely amazed by its unique exterior! For sure you haven’t seen a home shaped like a tent! Aside from its shape, what are other features of the house do you like the most? Wow. This is so gorgeous. I would live there full time. I love the way it is set up and the clean design. Woah!! 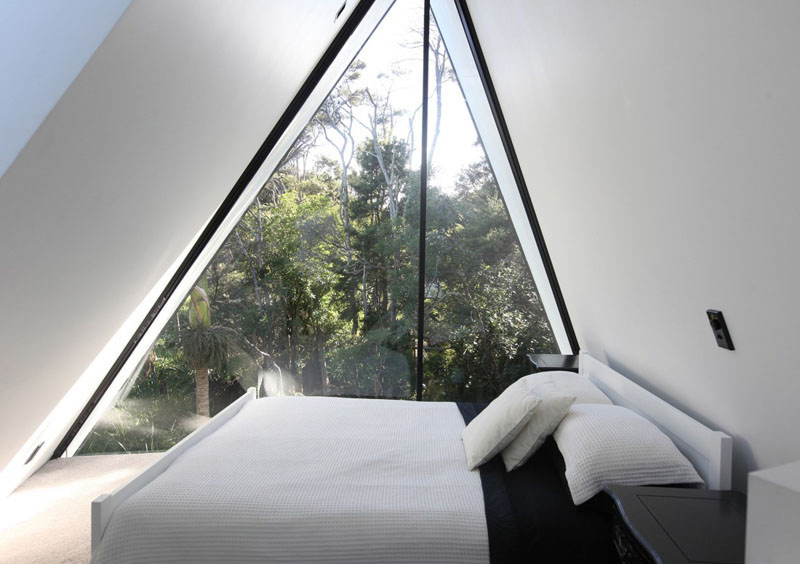 This tent house is so incredible and fantastic. I really like the whole set up. I will really add this to my bucket list. That is such a cool home! Architecture is my first love, so I enjoy seeing new innovative designs like this.